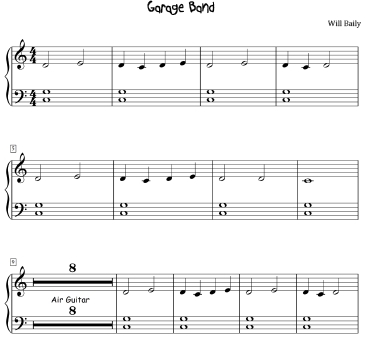 Garage Band - We offer summer camps for beginning piano students in the summer. 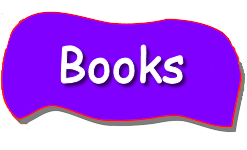 All of our students start in “Way Cool” Keyboarding 4 Kids. At the end of our 5-day camp our students play for their families and friends. They play “Sun-Up”, “Back N’ Forth”, “A Mile in the Rain”, “Lavender”, “Echo”, “Sittin’ by the Lake”, “Way Cool” Chords 1, a couple of their favorite pop songs with RH chords, “I Can Fly” and . . . “Garage Band” and “Stuntman” from this site. 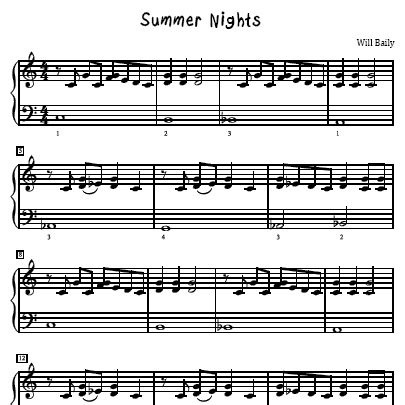 It’s fun for kids to put their shades on and play air guitar during the 8 measure break in this tune. 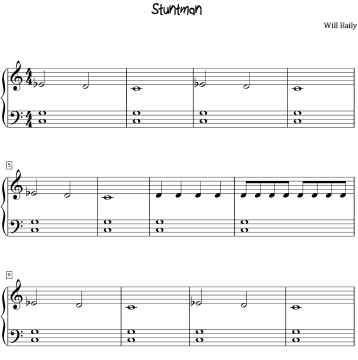 Stuntman - We offer summer camps for beginning piano students in the summer. All of our students start in “Way Cool” Keyboarding 4 Kids. At the end of our 5-day camp our students play for their families and friends. They play “Sun-Up”, “Back N’ Forth”, “A Mile in the Rain”, “Lavender”, “Echo”, “Sittin’ by the Lake”, “Way Cool” Chords 1, a couple of their favorite pop songs with RH chords, “I Can Fly” and . . . “Garage Band” and “Stuntman” from this site. There are always a few kids who prefer break dancing during this tune. Coaster Ride - Complete with roller coaster sounds and screams, this tune is fast moving and fun, especially for younger students. Imagine an afternoon at an amusement park or carnival. Hands sticky with cotton candy and the nervous excitement waiting in line to board the roller coaster. Get ready to have fun and don't forget to scream. 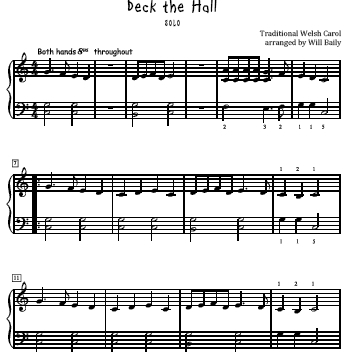 Deck the Hall - American English translation of words: Deck the hall with boughs of holly = Decorate the room with holly. Tis the season to be jolly = Christmas is a happy time. Don we now our gay apparel = We’re wearing bright colored festive clothes (drag out the Chrismas sweater Aunt Lucy knitted last year). Troll the ancient Yule tide carol = We’re walkin’ around singin’ Christmas tunes. Put a Fa la la la la, la la la la between each stanza and you’re ready to enjoy this cheery Yule tide duet! 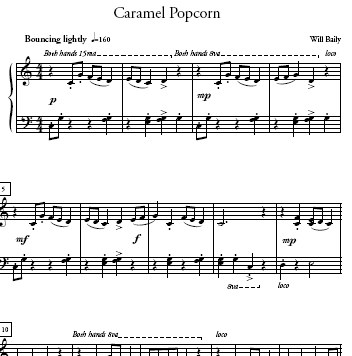 Caramel Popcorn - A happy tune in C position, a partner to Cotton Candy, Coaster Ride and Clown. 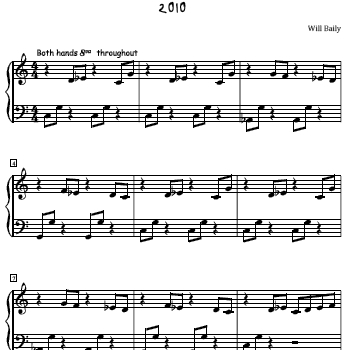 All four of these tunes use only the 10 notes in C position - on the staff that is. 8va and 15ma suggest you play all over the keyboard. 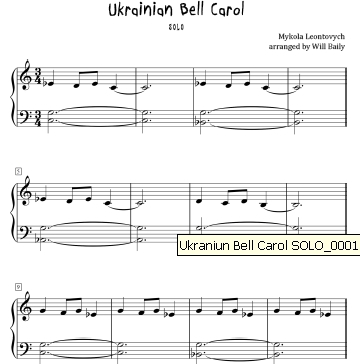 You might want to begin this piece ignoring the octave displacement suggestions. 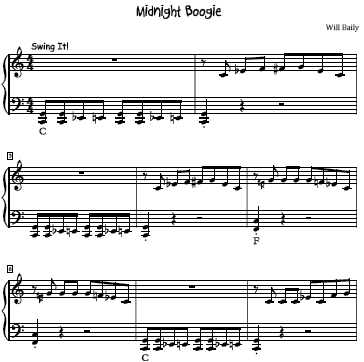 Then, when you get comfortable with the notes, rhythms and articulations, try moving across the piano. 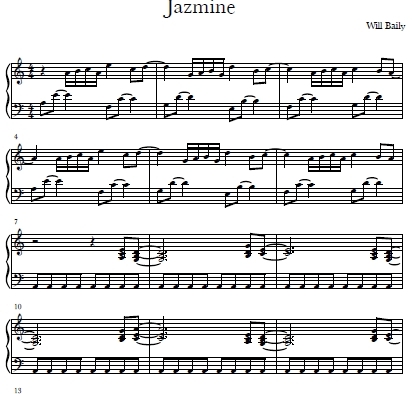 When you play this piece, can you hear the popcorn popping? Can you smell the caramel popcorn? Have fun! 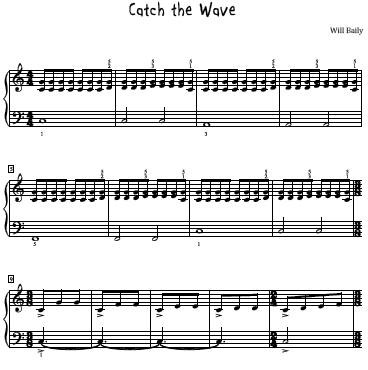 Catch the Wave - This rock tune for kids provides an opportunity to experiment with all the amazing electric guitars on digital pianos. Try distortion, crunchy, guitar hero or any other lead guitar that you like. Most of the lead guitars need to be played an octave higher than written. Have Fun! 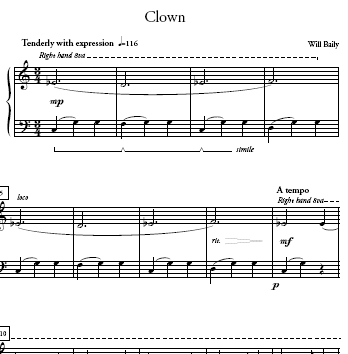 Clown - This is a tune for kids. Clowns come in all sizes and shapes. Some are goofy, some are funny, some are sad and some can even be scary! As you listen to this tune, let your imagination run wild. What kind of clown is this tune describing? Can you see her/him in your imagination? Can you draw this clown? 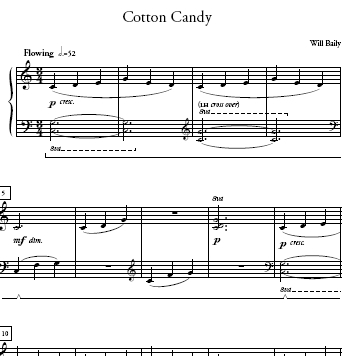 Cotton Candy - This is a tune written in C position. Even though it moves all over the keyboard, it is written with only 10 staff notes. 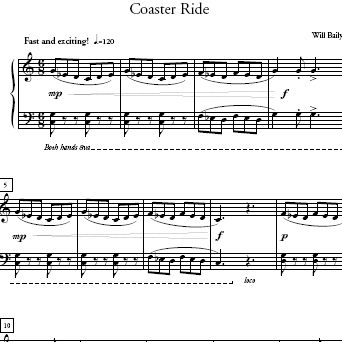 “Coaster Ride” and “Clown” are also written with only C position notes. This tune is light and fluffy and when you turn on your imagination you'll be able to see some of the candy wisps floating in the air. You might even be able to remember the smell and taste of this favorite sweet treat. 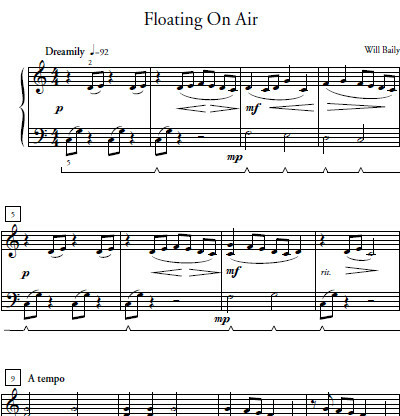 Floating On Air - This gently flowing tune gives the impression that you're on a magic carpet or floating on a cloud. A nice light tune to start the new year, “Floating on Air” has been a favorite SonaTune for many years. May there always be music in our lives. Wishing you all a Wonderful, Prosperous, Happy 2013! Forbidden City - This haunting little duet conjures up images of hidden cities under the sea, on mountain tops and in forests; cities filled with mermaids, monks and recluses. Explore all types of orchestral voices on your digital keyboards to paint a picture of the Forbidden City you’re imagining. 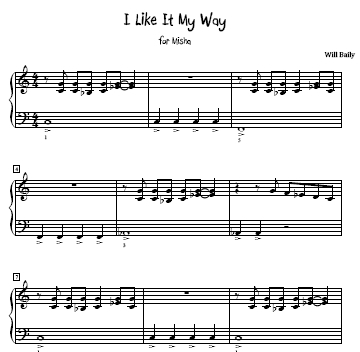 I Like It My Way - This is the first tune written by request for a student of one of the site's members. Misha is a 7 year old boy who wanted a rock song written especially for him. It's always the music that motivates us to want to play! Have fun with “I Like It My Way,” Misha. 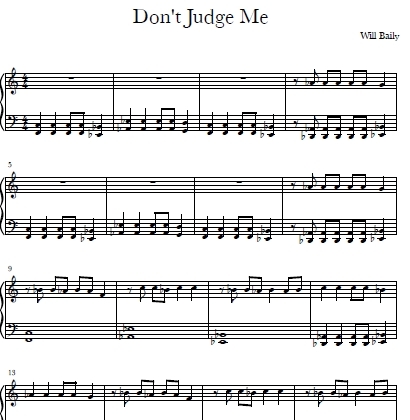 Hey, I bet you could write words to this tune. 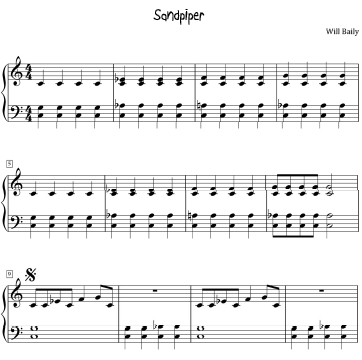 Sandpiper - Years ago when we lived on North Padre Island, I would run on the beach. The Sandpipers that lived there were small and knew how to bust some crazy moves. They would move quickly forward then, quickly switch from side-to-side and without missing a beat do a complete 180 and trot in the opposite direction. This tune is dedicated to those crazy little dancing birds. 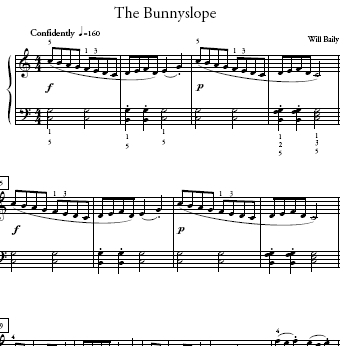 The Bunnyslope - This spirited tune introduces a descending C major scale. 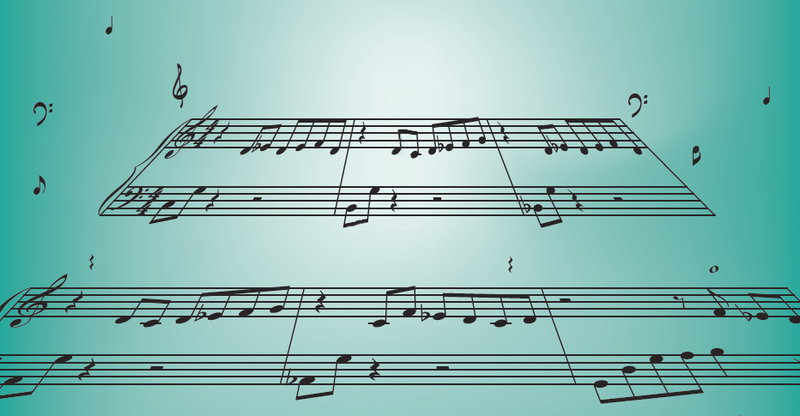 It’s always more fun to experience technique in a piece of music. 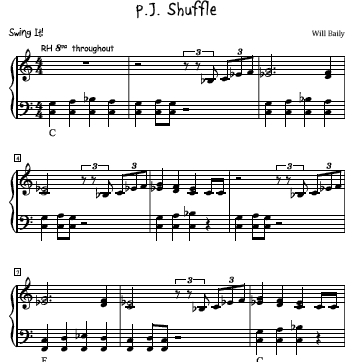 The 3 speeds on the mp3 files are varied so that you can play slower at first. 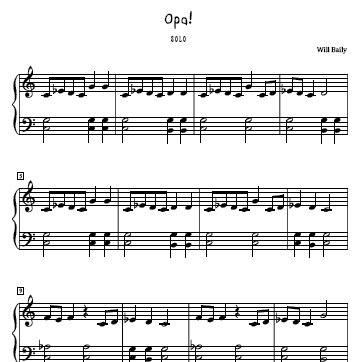 Then, as you become more comfortable with the piece, increase to mp3 MED. When you feel really confident, try the mp3 FAST. Have fun! 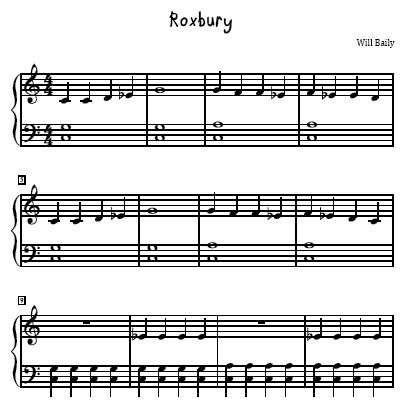 Beverly Hills - A soft rock/funk accompaniment juxtaposed against a gently flowing solo piano (electric piano) part has one feel with the orchestration and a totally different feel when played without the orchestration. 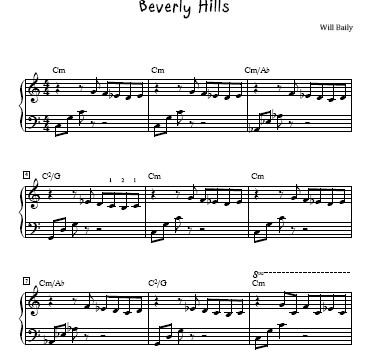 Reminiscent of movie tunes from the ’80s, Beverly Hills is fun for pianists of all ages. Check out the tutorial on the tutorial page for ideas to create your own band. 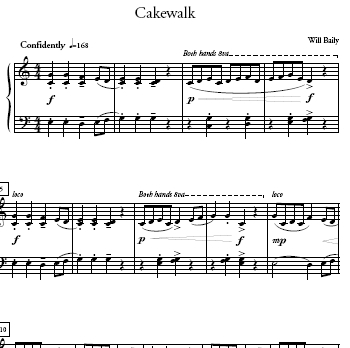 Cakewalk - There are several pieces below that all start with the letter ’C’ that are Carnival related pieces. A Carnival event that is popular in rural areas goes like this . 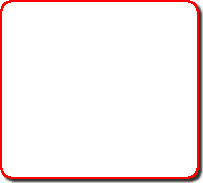 . . numbered squares are laid out on a path. Tickets are sold to participants, with the number of squares in the path equal to the maximum number of tickets sold. The participants walk around the path in time to music, which plays for a duration and then stops. A number is then called out, and the person standing on the square with that number wins a cake as a prize (hence the name). 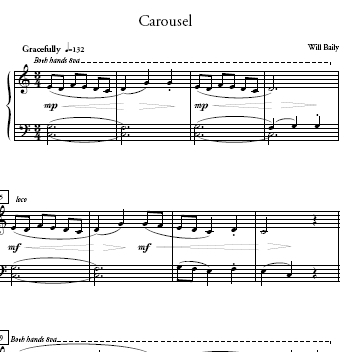 Carousel - Another one of the “Carnival” tunes that are in C position. 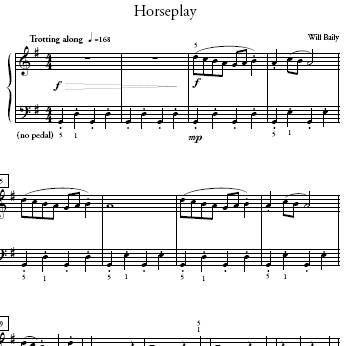 Along with Caramel Popcorn, Coaster Ride, Cotton Candy, Clown, Cakewalk, this tune reminds us of the fun we had at the carnival, jumping on the carousel and finding a colorful plastic horse to ride ‘round and ‘round. 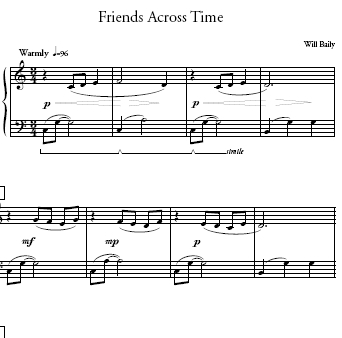 Friends Across Time - With the holidays quickly approaching, this tune paints a picture of those special times when friends gather and share food, wine, stories and laughs. It’s amazing the connections we form. At this time of year, we tend to remember holidays past and all those friends we’ve made throughout the years; all those “Friends Across Time”. Horseplay - When I was a kid, Sunday afternoons were spent riding horses up in the hills of Western Nebraska. We kept our Pinto pony and Palomino at my Uncle Rod’s farm. The smell of morning grass and hay . . . shaking the oats and watching the horses run toward us from the pasture . . . and then riding through the open plains. This lively tune is how I remember those Sunday afternoons. 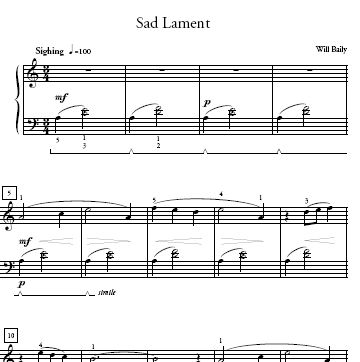 Sad Lament - The emotional connection we have to music is powerful! 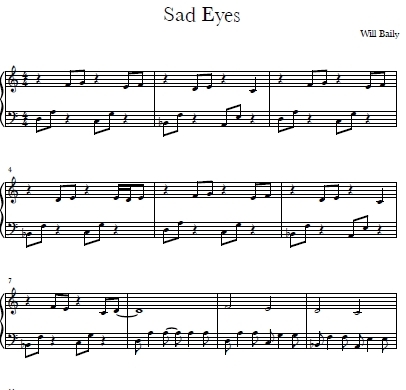 Sadness is one emotion that can express itself in minor keys and with sighing, lyrical lines. When words don't seem capable of communicating our heart's lament, music becomes the vehicle of expression. 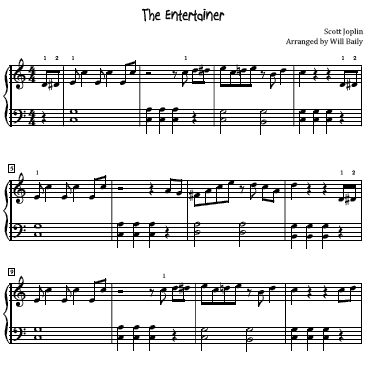 The Entertainer - One of the world’s best loved tunes, written by Scott Joplin in 1902, this ragtime gem is appreciated in both the popular music world and the classical music world. Probably best known to many from Marvin Hamlisch’s adaptation and orchestration heard in the 1973 film “The Sting”. 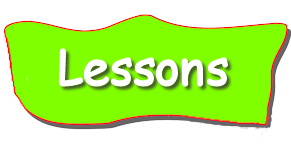 This arrangement is intended for RMM students of all ages. Enjoy!